Biomass briquettes are made from natural waste such as grain husk, bagasse, refined municipal waste, certain variety of weeds and other natural substances which are left out after oil and food grain production. They are made by compressing and molding these substances to create a solid mass or a briquette. This can be used to heat boilers in industries, generate electricity, and can also be used for cooking needs. The waste is compressed under pressure to increase the energy obtained from the biomass, and also to make them potable and easily combustible. 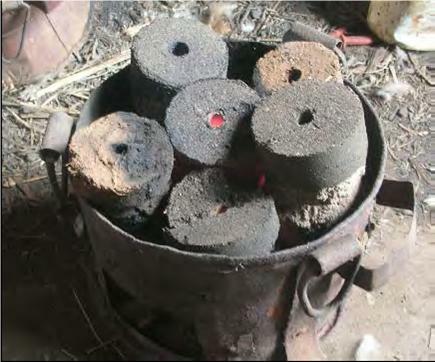 Burning a compressed briquette would give more directed energy than a large quantity of normal biomass. The primary advantage in using them is recycling waste products productively, to create a source of energy. Secondly, these briquettes do not pollute the environment as much as wood and coal would do, thereby making them relatively safer to use. The most important advantage is that they are an alternative to conventional energy sources, thereby reducing our dependence on such natural resources which can near depletion at the current rate of consumption. An example of such biomass usage is during the creation of biofuel from Jatropha seeds, where the seed mass left after oil extraction is dried and used to power boilers. Such an innovative usage helps us in optimally use the resources to the fullest extent possible, thereby making it more economically viable. Also, these briquettes can be easily transported and do not pose any inflammable hazards. Although biomass briquettes constitute a small negligible fraction of our energy needs, they are still useful as they can be used wherever possible, to reduce our dependence on conventional fuels. In a community based approach, the biomass waste generated by industries can be used for cooking needs, thereby in a small way creating efficiency in energy usage. These briquettes have a high energy output, and can be easily manufactured from a wide range of natural raw materials and are also environment friendly as they do emit comparatively less toxic gases. In another widely used way of manufacturing biomass briquettes, the raw materials are first partially burnt with limited air supply. This process is called charring, and after that they are compacted and molded into briquettes. The resultant briquettes emit very less smoke when burnt again, and give the same energy output. This variety is very useful for cooking and domestic usage where emitted smoke is a major criterion in choosing a fuel source. However, manufacturing such briquettes should not take precedence over food cultivation and other uses of grain husk and bagasse. Alternate energy sources, though very useful should not be given reference over basic human needs such as food and fodder. There is a need for creating awareness amongst cultivators so that such fuel sources can be parallelly synthesized along with regular crop production.